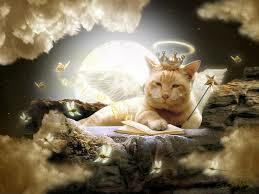 One day a cat dies of natural causes and goes to heaven. There he meets the Lord Himself. The Lord says to the cat “you lived a good life and if there is any way I can make your stay in Heaven more comfortable, please let Me know”. The Lord stops the cat and says “say no more” and a wonderful fluffy pillow appears. The Lord says “say no more” and fits each mouse with a beautiful pair of roller skates.